The SandCastle’s two levels of sleeping and activity areas, totaling 19,000 square feet, spiral around a courtyard. Lined, outside and in, with a sandstone finish, the building looks as if it might actually have been sculpted from the dunes the hotel sits behind. Poking out from the exterior walls at odd, Flintstonian angles, iroko-clad volumes are meant to evoke boats and beach cabins. Windows can be slightly lopsided. “If you look at children’s paintings, the shapes are irregular, spontaneous. When lines aren’t always completely horizontal or vertical, kids recognize their own code of expression,” she explains. The uniform sandstone color keeps things from getting too topsy-turvy. Paint appears only in the sleeping alcoves, where walls are blues and greens evocative of the Ionian Sea below. 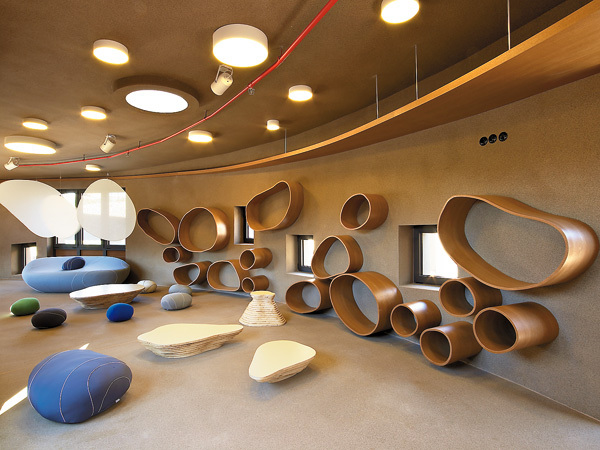 Providing alcoves, open to the curved hallway, rather than bedrooms with doors, is one of the ways that she encourages a sense of community among the SandCastle’s junior inhabitants. “The children don’t feel isolated, but they have their own space,” she notes. Alcoves feature small bunks with built-in toy storage and kid-controlled night-lights. “There are also openings in between, little communication portals that encourage kids to be social,” she adds. The corridor between the rows of alcoves serves not just as a thoroughfare and a vantage point for adult supervision but also as a playroom equipped with soft wool-upholstered floor cushions. And every­thing in the building is child-size, right down to the restroom and showers. The scale shift is even more apparent at the 8,300-square-foot Cocoon for younger kids, a short walk away. Not only are the ceilings of the two buildings only 7 feet 9 inches tall, the lowest clearance allowed by local code, but restroom washbasins and toilets are miniature, and outdoor showers stand just 4 feet high, their fittings placed within reach of tiny hands. Helping toddlers feel at ease-rather than encouraging independence, like the SandCastle-the sleeping arrangements are fully communal here, the geometries more organic and fluid. “With everything soft and rounded, there’s a smooth transition from one space to the next. It has the protective feeling of the womb,” Paraskeva says. That effect is enhanced by the fact that the entire site is a kind of valley sunken 13 feet below the surrounding ground level, with green roofs on both buildings helping them blend with the landscape. In the very center, protected by the arcs of the buildings on either side, is an area that she’d planned to fill with water. That plan was scaled back, midway through construction, to a wading pool and weatherproof iroko decking surrounded by sand pits. Paraskeva used as many natural, sustainable materials as she could. “Wood is friendlier than synthetics to young children, who crawl and walk barefoot,” she says. Iroko is everywhere, and lengths of bamboo appear as guardrails and as an inventive linear fixture. Careful planning has reduced energy use, even though temperatures on the Greek coast during the summer season, when the resort’s in full swing, can reach more than 90 degrees Fahrenheit. The Cocoon’s green roofs have insulating properties, both camps face north, minimizing sun exposure, and air shafts create natural ventilation. Of course, none of these eco credentials are going to impress a clientele that tends to come down on the side of bigger toys and more to climb on. The camps ultimately owe their child-appeal to Paraskeva’s vivid imagination, which allows her to cloak even the most mundane details in a kid-friendly guise. She made light fixtures out of galvanized-steel buckets and cans, and even the fire escape looks like a playground slide. This entry was posted in Design, Travel. Bookmark the permalink.